I started to study permaculture when I lived in Elkins Park, an inner suburb of Philadelphia. Permaculture was our gateway to gardens and chickens and bees. Our work on that tiny piece of land gave us joy, and it inspired connections with the people in our community. One of those people was a young neighbor. She gave one of the four hens a name: StellaLou. And, although our best chicken is no longer with us, she did make the journey to the new farm and inspire its name. “StellaLou” brings with it an association of beauty and function, of adventure, and of connection. With our move to StellaLou Farm: more gardens, chickens, and bees…and honey…and mead! We had considered several enterprises on the land that could produce income. We thought that mead might be a good choice as a value added product for our honey, and we had been making mead for our home, family, and friends. We are focused on making mead with quality ingredients sourced from our farm and from our neighbors’ farms and apiaries. This inspires critical attention to right stewardship of the land and healthy function of the soil, the insects, and the animals, as well as the plants, shrubs and trees. It cultivates positive connections with our local communities. When we invite someone to sip a glass of our mead, we call their attention to the importance of these relationships. And, yes! We get to do this! Paul tasting a traditional dry mead aged in a bourbon barrel. 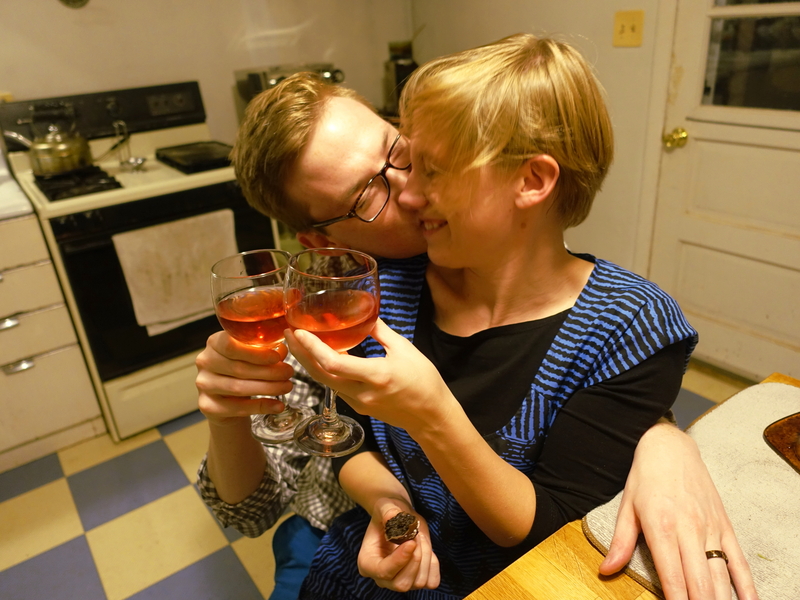 Hannah and Paul toasting in the new year with a dry black currant mead. Aside from making a good mead, starting a meadery is a challenge. While we are renovating this farm, we are also making test batches, studying the techniques and processes involved in mead making, experimenting with equipment, and preparing for what is required for licensing. Last week, we took the opportunity to visit California and take a Continuing Mead Making course and a Business of Making Mead course. Wonderful people and beautiful location! Some of the topics that were addressed included: Fermentation, Yeast, Sensory evaluation, Honey varietals, Mead faults, Honeybee health, Sustainability, Sanitation, Ecological footprints, Regulations, Labeling, Marketing, Planning, and Designing. Our heads are spinning with all the new information we can incorporate into our mead making and our business planning. Here’s some background on the UC Davis Honey and Pollination Center that puts the program together. Hannah has been working on our new logo for “StellaLou” Farm and “Stella Too” Meadery and I can’t wait to show you. I’ll be highlighting information related to Stella Too on this site so you can follow our journey. Maybe one day soon, we’ll get to share a glass of mead with you! I posted this video on Facebook but I like it so much, I want to post it here as well. J and Hannah and Paul bottled and corked over 80 bottles of mead without pause or flaw…like a well-oiled machine. I think this is beautiful work!